The outermost island off the Dalmatian coast, just 30 miles from the Italian coast, Vis is exactly what you would expect–unspoiled, rugged, rising majestically out of the Adriatic and crowned by its three mountains. It’s hard to imagine that all this quiet, natural beauty hides such a tumultuous history. Centuries before Christ, Vis was the most powerful force in all the Adriatic! In the 4thC BC, the sea-faring Greeks quickly realized just what a strategic prize Vis was and colonized the island, calling it Issa. As Greek power expanded in this part of the world, Vis became a major Greek “polis” and later, an independent city-state so powerful that it even minted its own money. Despite being so far out in the Adriatic, the Greeks used Issa to impose its rule all the way to the Dalmatian coast; founding colonies in Lumbarda (on the island Korčula), Tragurion (present day Trogir), Epetion (Stobreč, south of Split) and Salona (Solin), which after the Romans wrested control from the Greeks in 219BC, became their land-based capital city. Today, Vis is known an the island of fishermen and winegrowers and is loved for its beautiful beaches, nature, ecological agriculture, traditional architecture and as the place where Marshall Tito directed the partisans from his secret cave here during WW2. After the war it was turned into a military based and closed to the public until 1992. The negative effect was a considerable exodus of the island;s population, But the positive effect was that Vis was not only spared the wave of commercial tourism which swept Hvar and Brac (Solta for some reason was and still is unspoiled) but nature was allowed to run wild for almost 50 years, creating much of the island’s beauty we see today. Komiza, a sweet little village on the south side of the island, is the place that many historians consider to be the cradle of fishing in the Adriatic. 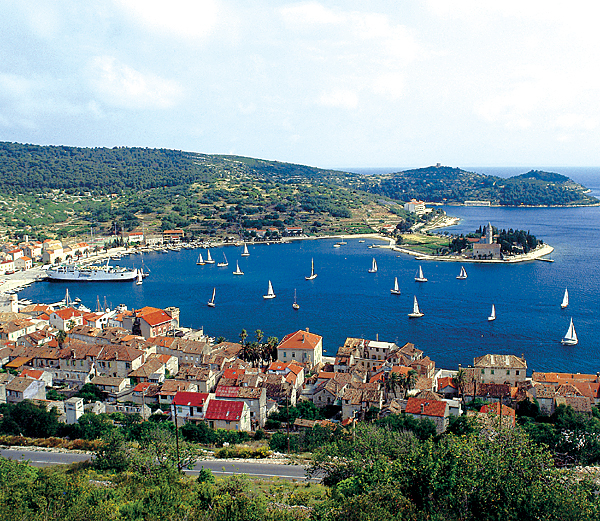 The approach by ferry into the main town port is spectacular, with sweeping panoramic views and beautiful light. Be sure to take some photos of Zonkos Palace, a handsome Venetian style villa. And visit the Fishermen’s Museum, originally a fortress built in the 16th century. Tito’s Cave is actually two caves reached by stone staircases (200 steps!). Daily ferries from Split—but you can’t back on the same day, so you will have to spend a glorious overnight or even longer, lucky you!